Saumya Dhyani of class X secured the First position in `Indian Team Selection Trial – I’ held on 26th Dec 2018 at Dr Karni Singh Shooting Ranges- Tughlakabad. Our Under 19 girls Football Team participated in the Inter school U-19 Girls Football Tournament held at Delhi Public School, Ghaziabad from 26th to 29th Dec 2018. 16 teams from Delhi and NCR region participated in this tournament. Our team secured first position. Our Under 12 girls basketball team participated in Noida Winter League Basketball Tournament at Sports Club, Sector 122 Noida on 29th and 30th Dec 2018 . Seven teams of Delhi and NCR participated in this tournament and our school team secured First Position. 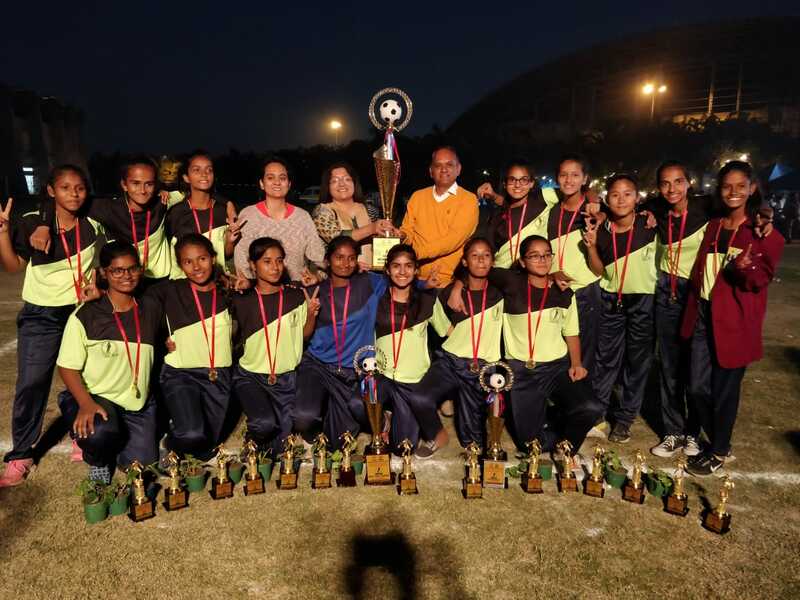 Our girls football team won the Shri Anuragh Narayan Memorial Inter School Football Tournament held at NOIDA stadium from 18th-25th Nov 2018. They defeated Sapphire International school by 5-0 in the finals. Our team also won a cash –prize of Rs. 90,000/- Prachi Jha was awarded the best play of the tournament as well as the highest scorer with 15 goals. She was awarded a Maroon Blazer and a cash Prize of Rs. 5,000/-. Poonam Kumari was declared the best goalkeeper of the tournament and given a cash prize of Rs. 5,000/-. 62nd National Shooting Championship Competitions (NSCC) Rifle/Pistol event was held in Thiruvananthapuram from 15th to 30th Nov 2018 which was conducted by National Rifles Association of India. Saumya Dhyani of class XII represented UP state and bagged the Second Position in the competition. Delhi Golf Society along with Amandeep Joshi Golf Academy club Gurugram organized Sela Qui International Inter School Golf Championship at Classic Golf and Country Club Gurgaon from 27th to 29th Nov 2018 in category A and B (13-17 Years). 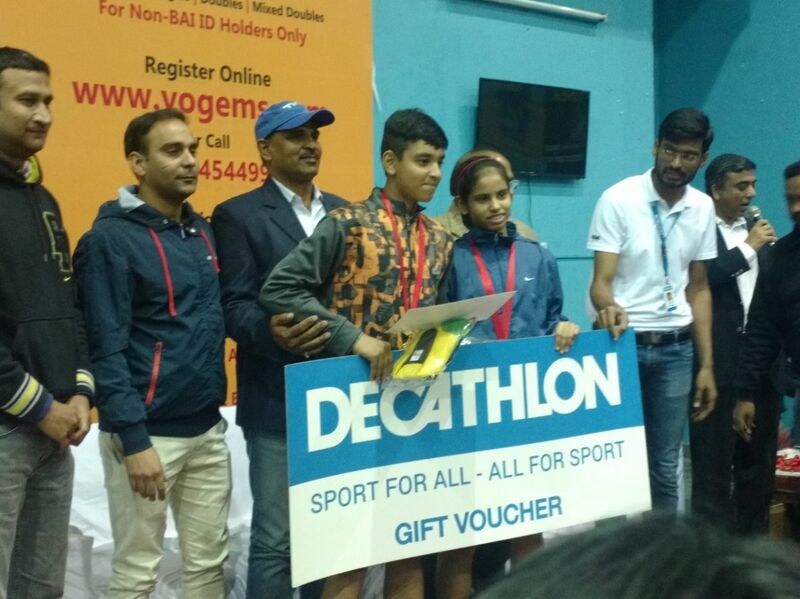 Two of our students Akshat Sharma and Arin Ahuja of class IX competed in this tournament and won the First Prize. Vijayant Thapar Memorial Inter School Football Tournament. APS NOIDA hosted the XII Vijayant Thapar Memorial Inter School Football Tournament from 30th Oct 2018 to 03rd Nov 2018. 12 teams from Delhi and NCR schools participated in the tournament. The tournament was inaugurated by Lt Gen Shri Krishna Singh, PVSM, AVSM UYSM (Retd) who is presently the Hon’ble Member of the Armed Forces Tribunal, Delhi along with Mrs & Col (Retd) VN Thapar, parents of Shaheed Capt Vijayant Thapar, VrC (Kargil). 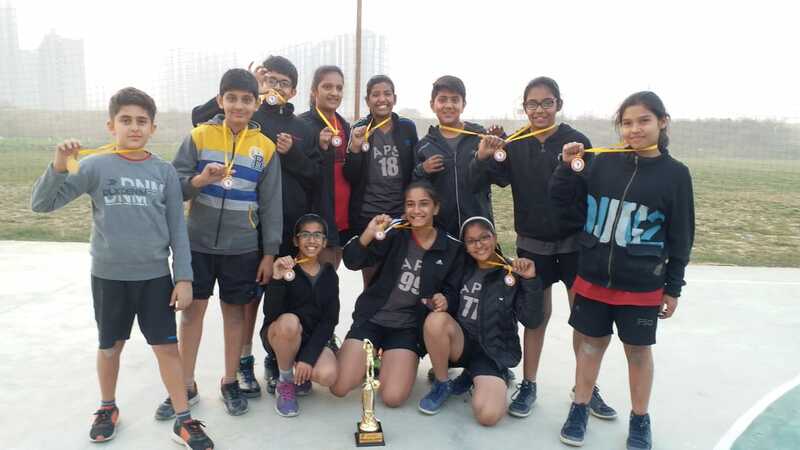 The final match was played between APS NOIDA vs Step By Step School, NOIDA on 03rd Nov 2018. Step By Step School, NOIDA won the match by 02 goals. APS NOIDA was the first runners up. The award for the highest scorer of the tournament was shared by Mehul Sapra of Step by Step School, NOIDA and Archit Rana of APS NOIDA. APS NOIDA Organized the Inter School Girls Football Tournament 2018 from 09th to 12th Oct 2018. Eight school teams participated in the tournament. Step By Step School NOIDA won the tournament. APS NOIDA team secured 2nd Runner up position. Harshit Tomar (IX) won the UP State U-15, Badminton Tournament doubles organized by Gorakhpur Badminton Association. He received a cash prize of Rs 2,500/-. Saumya Dhyani ( X) secured first position in the 20th UP State Inter School Air Pistol Shooting Competition (Girls category) held at Meerut The competition was organized by UP State Rifle Association. Devaditya Singh ( VI) secured Gold Medal in Mabuni Cup-2018 in U-12 years category in the National Level Championships organized by All India Shitoryu Karate-do Union affiliated to Karate Association of India. Pushkar Singh(class X) secured Gold Medal in Mabuni Cup-2018 organized by All India Shitoryu Karate-do Union affiliated to Karate Association of India. 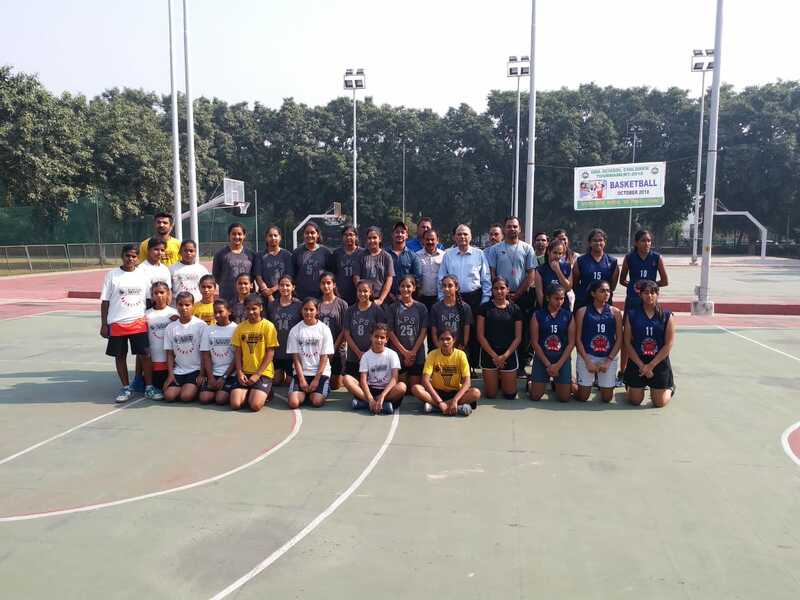 Our school U-19 Girls Basketball Team participated in the DDA School Children Basketball Tournament 2018 held at Netaji Subhash Sports Complex, Jasola (Delhi) from 25th to 30th Oct, 2018. Our school basketball team secured 1st position in the tournament. School Sports Promotion Foundation Tournament. Our boys U-15 football team participated in School Sports Promotion Foundation Tournament sponsored by Sports Authority of India and conducted at different venues. Our school team won the first match held at Maharishi University of Information Technology, NOIDA on 01st Sep 2018 and the same. UP State U-15 Badminton Tournament. Harshit Tomar, class IX won the UP State U-15, Badminton Tournament doubles championship held at Gorakhpur from 15th to 17th Sep 2018. The tournament was organized by Gorakhpur Badminton Association. He received a cash prize of Rs 2,500/-. Delhi Area Cluster APSs Basketball Tournament. 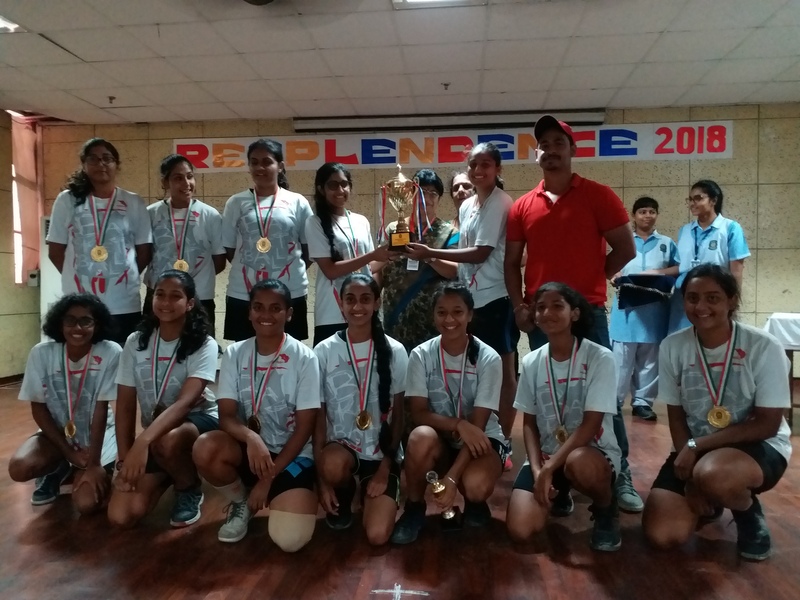 Our Girls team secured 1st position and the Boys team secured 3rd position in the Delhi Area Cluster APSs Basketball tournament held at APS Dhaula Kuan on 12 Sep 2018. Inter School Air Pistol (Girls)Shooting. Saumya Dhyani, class X secured first position in 20th UP State Inter School Air Pistol Shooting Competition (Girls category) held at Meerut from 27th to 30th Sep 2018 . The competition was organized by UP State Rifle Association. Our school U-14 Boys badminton team secured the 1st position in the Pragyan Sports Meet held at Pragyan School, Greater NOIDA . U-17 Girls badminton team secured 1st position in the in Pragyan Sports Meet held at Pragyan School, Greater NOIDA. U-17 Boys badminton team secured 2nd position in the in Pragyan Sports Meet held at Pragyan School, Greater NOIDA. U-16 Boys football team secured 2nd position in the in Pragyan Sports Meet held at Pragyan School, Greater NOIDA. Delhi Area Cluster Inter APS Badminton Tournament. 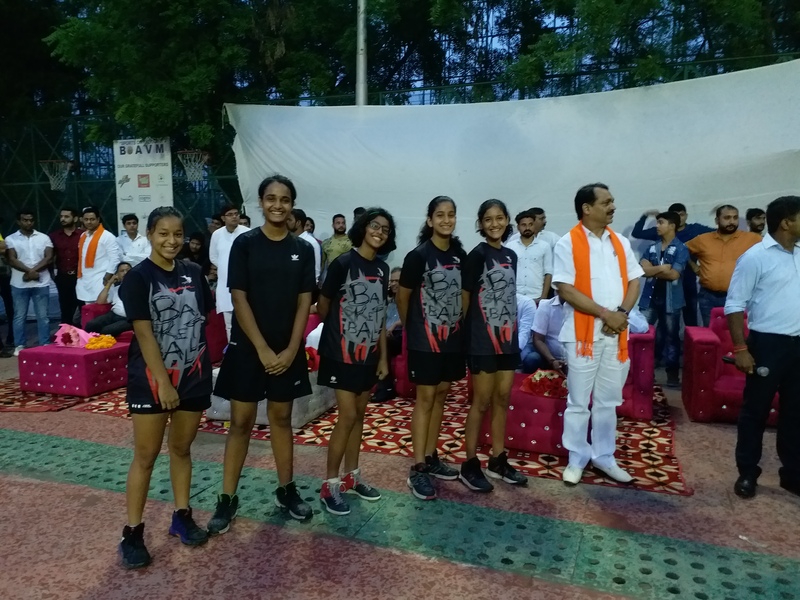 Our school Badminton Team participated in the Delhi Area Inter APS Badminton Tournament held at APS Shankar Vihar on 21 August 2018 and secured 1st position in Girls Singles & Doubles ; 2nd position in Boys singles and 2nd position.in Mixed Doubles. (i) Pushkar Singh, class X participated in Mabuni Cup-2018 held at Karnataka (Mysore) from 25th to 26th August 2018 and secured Gold Medal in the tournament. (ii)Devaditya Singh, class VI participated in Mabuni Cup-2018 in U-12 years category in the National Level Championships held at Mysore from 25th to 26th August 2018 and secured Gold Medal. He was selected to represent the country at an International Level. 1st NOIDA Open Basketball Tournament. Our school Senior Boys Football Team secured 2nd position in the Inter School Sports Meet organized by Vishwa Bharti Public School NOIDA from 24th to 28th August 2018. 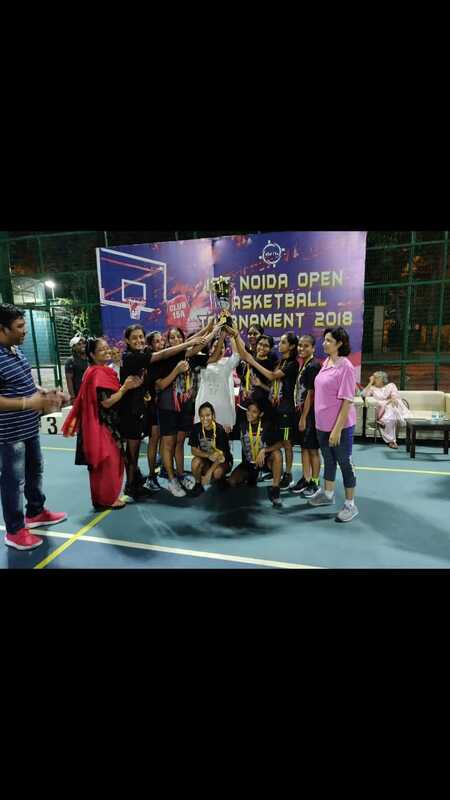 Our school Senior Girls Basketball Team secured 1st position in the Inter School Sports meet organized by Vishwa Bharti Public School NOIDA from 24th to 28th August 2018. Batul Talib of class IX participated in All India Sub-Junior Ranking Badminton Tournament held at Hyderabad from 01st to 08th August 2018. She played up to the third qualifying round. Inter APS Boys Football Championship. Our senior boys football team participated in the inter APS football tournament held at APS Dhaula Kuan on 03rd August 2018 and secured 3rd position. 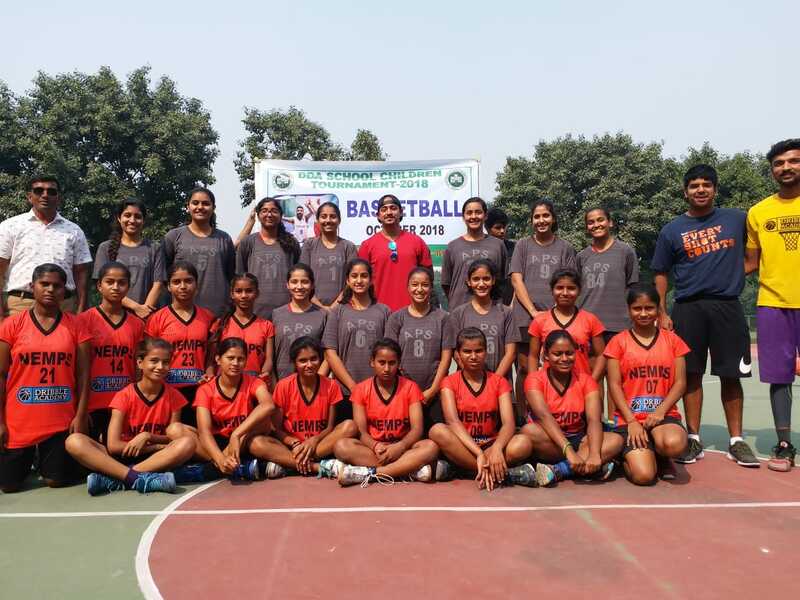 District GB Nagar U-19 Girls Basketball League Tournaments. Our school girls basketball team participated in District GB Nagar U-19 Basketball League Tournaments held at different venue in NOIDA. Our school team played the first match against Genesis Global School, NOIDA on 30th July 2018 and won the match. The second match was played with Amity International School, NOIDA on 03rd August 2018 also won by the school. U-16 UP State Basketball Championship. (i) Won Gold medal in under 17 Girls’ Championship organized by Addidas Aspiring on 05th December 2017. (ii) Won Gold medals in under 15 girls, under 17 girls, under 15 mixed double and under 17 mixed double tournaments organized by District Badminton Association on 15th & 16th December 2017. She also won the District champion trophy of emerging players. 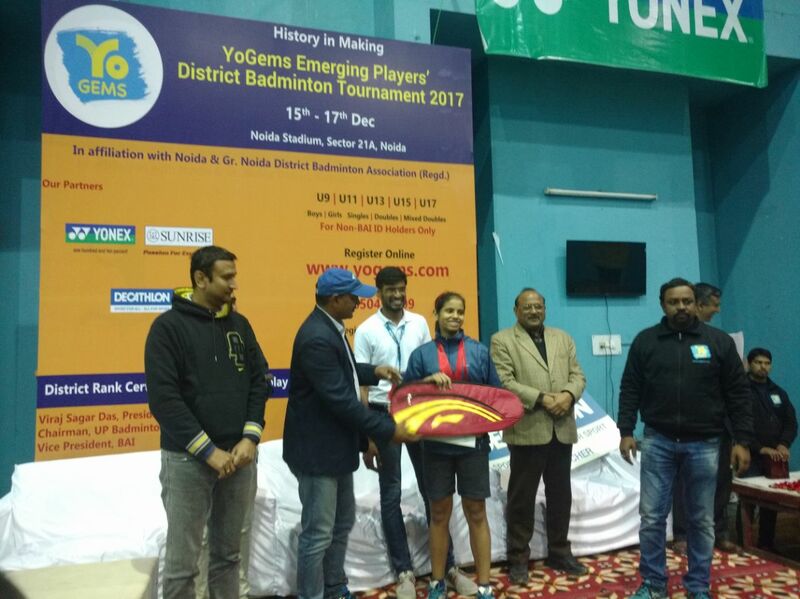 (iii) Participated in Elite Group under 15 Girls championship organized by YoGems and Badminton Association of India held on 17th December 2017 and won Gold medal. U-19 (Girls) Junior Football Championship. Neha Sharma Sangma, class XII and Rushika Tyagi, Class XI of our school represented Delhi State in the U-19 (Girls) Junior National Football Championship held at Cuttack, Odisha from 26th July 2017 to 10th August 2017. The tournament was organized by All India Football Federation. Delhi team secured third position in the tournament. Inter School Girls Basketball Tournament. 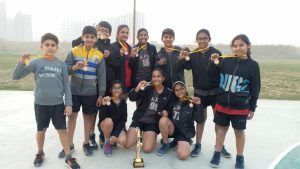 APS NOIDA Girls Basketball team participated in an interschool sports meet held at Pragyan School, Greater NOIDA from 28th to 30th August 2017. 12 teams from Delhi NCR participated in the tournament. Our Girls Basketball team secured 1st position in the tournament . APS NOIDA Girls Basketball team participated in an interschool sports meet held at Pragyan School, Greater NOIDA from 28th to 30th August 2017. 12 teams from Delhi NCR participated in the tournament. Our Girls Basketball team secured 1st position in the tournament. Delhi Cluster Inter APS Badminton Championship. Our school boys and girls badminton team participated in the Delhi Cluster Inter APS Badminton tournament held at APS Shankar Vihar on 30th August 2017. Our girls’ team won 2nd position.